A relaxing, lighter touch massage incorporating longer strokes to help soothe the body and soul. A more intense and therapeutic massage that utilizes strokes against the grain of the muscles, targets knots and adhesions and will leave you feeling refreshed. A specialized massage to help mothers-to-be relax, reduce stress and anxiety, and relieve aches and pains associated with pregnancy. This massage helps athletes to focus on sport-specific muscles with a combination of deep tissue techniques and stretching. This facial is for clients of all skin types wishing to refresh their skin by encouraging new cell growth, increase blood supply, and to stimulate collagen and the natural moisture factor of the skin. Alpha hydroxy acids stimulate and exfoliate skin cells deep in the epidermis while Vitamins A, C, D, E, and K combined with peptides help to nourish. Includes extraction. The perfect facial to maintain and promote healthy, beautiful skin! Ideal for the client experiencing a lack of firmness, visible fine lines and wrinkles. A cocktail of Lactic and Glycolic acid work to exfoliate and bring moisture to cells while peptides stimulate production of collagen and elastin to improve skin’s elasticity. Ideal for clients experiencing pigmentation caused by sun damage or uneven skin tone. A lactic acid peel is used to soften and remove dead skin while shedding excess melanin at the base of the dermis. This treatment is recommended in a series of 3-5. Be advised that alpha hydroxy acids increase your risk for photosensitivity- please stay out of direct sun for at least one week after treatment. This facial is designed for the client with blemished skin. An active blend of alpha hydroxy acids break down and dissolve sebum trapped in the pore to eliminate congestion and acne causing bacteria. Extractions are performed to remove sebum and a finishing touch of high-frequency is used to calm redness and inflammation in the skin. Achieve balanced, fresh, clean skin with this facial! Enjoy the benefits of Active Biogenic ingredients while you slip into deep relaxation. A Cranberry enzyme mask is used to exfoliate dead skin and stimulate collagen while preventing the signs of age and Vitamin and Peptide serums work to achieve glowing skin during the treatment. Massage is performed on the scalp, face, décolletage, arms, lower legs, and feet to increase circulation and promote lymphatic drainage to deliver full body rejuvenation. Extractions are not included. For the client that has uneven tone, dryness, or mild breakouts on their back. In this 50 minute treatment, a cleanse, scrub, and custom mask are applied to the back to bring balance to the skin while you enjoy the benefits of massage to sore muscles during this de-stressing treatment. Peels offer a more intense way of treating specific skin conditions by the use of highly concentrated alpha or beta hydroxy acids. These acids penetrate deeper layers of the dermis to do a variety of things such as stimulating collagen synthesis, evening skin tone, and even correcting acne. Peels do require an initial facial to determine the correct treatment plan. We do offer pre and post peel kits to assure the skin is properly prepped and maintained. Please note, peels may not be booked online – please call to book your service. Eyebrow or eyelash tinting is a form of semi-permanent dye formulated specifically for use on the eyelashes and eyebrows. 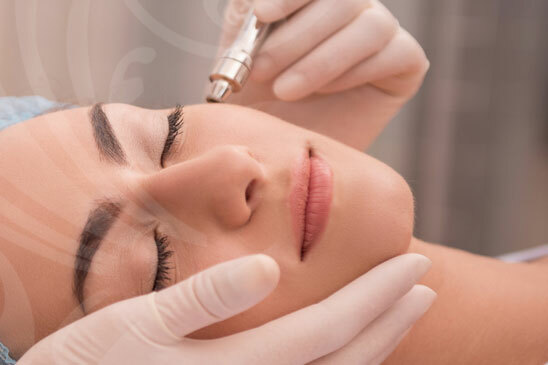 This treatment drastically reduces fine lines and leaves skin looking and feeling younger. 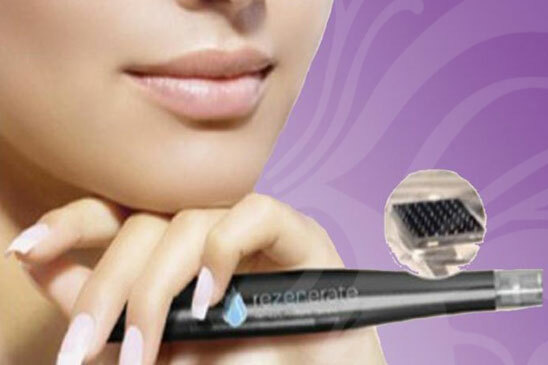 The Rezenerate painlessly creates hundreds of thousands of superficial microscopic permeations on the surface of the skin, leading to immediate plumpness. This allows for greater absorption of nutrients introduced during the treatment. 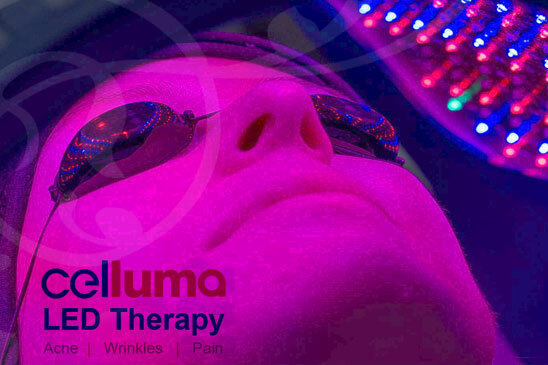 This phototherapy treatment uses Blue or Red light to improve acne or aging skin with this state of the art LED technology. Skin is healed from the inside out to provide luminous results. 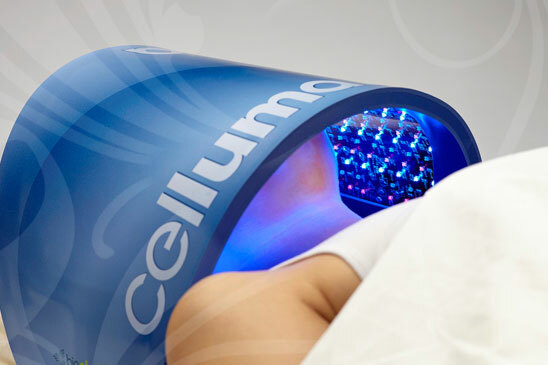 A double cleanse is performed, followed by 30 minutes under the Celluma LED panel, and finished with the appropriate serum and moisturizer. 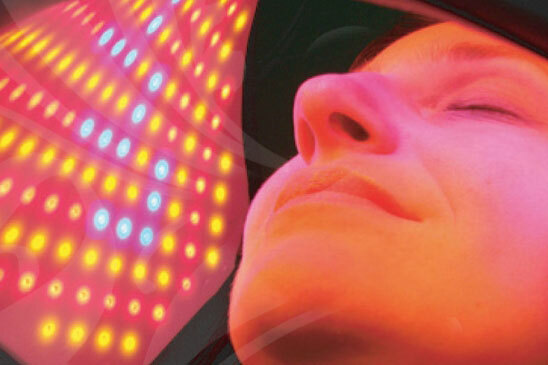 Reap the full benefits of complete cellular repair in this phototherapy package. Ideal for acne or aging skin clients. MFR is a safe and very effective hands-on technique that involves applying gentle sustained pressure into the myofascial connective tissue restrictions to eliminate pain and restore motion. Please wear a swim suit or shorts and a sports bra for this session. This is an energy healing practice that originated in Japan. The practitioner’s hands are placed lightly on or just above the client, with the goal of using the universal life force energy to help the client relax and facilitate healing. You will remain clothed for this session. CST is a gentle, hands-on method of evaluating and enhancing the craniosacral system, which is comprised of the membranes and cerebrospinal fluid that surround and protect the brain and spinal cord. A soft touch is used to release restrictions in the craniosacral system to improve the functioning of the central nervous system. With few contraindications, CST can help a wide variety of problems and conditions, including but not limited to, migraines, chronic neck and back pain, and TMJ. You will remain clothed for this session.